Since students have been contacting me asking me to comment on my work or to interpret some of the poems they have read at this site, I thought it would be useful to take one poem and look at it to see how the poem came to be written and what might be going on in it. A poet doesn't necessarily know why a poem got written or what a poem might be 'about'. Neither can poems be 'explained'; if they could be, there would be no purpose in writing them. On the whole it's best to let poems speak for themselves, but in this instance it might help those students who are interested in writing about poetry, or writing their own poetry, to develop their ideas and critical skills. I was lying in bed one morning in September 1993 when I was suddenly woken by an exalted cry of pleasure from a crowd of people across the harbour from where I live. They had just heard Juan Antonio Samaranch's fateful words: "The winner is Sydney." Sydney had been given the opportunity to stage the 2000 Olympic Games. I wrote most of the poem that follows in the early morning hours following that announcement. Subsequently, I modified the poem and changed details, but essentially the poem that follows exists more or less as it was written that morning. Here is the poem. Whose wreath is earned if cleanly gained. Perished then in testing times. An image here of freedom, peace and art. For celebration, friendship and renown. Now it has to be said straight away that for some people in the world of contemporary poetry a poem such as the one above is a hopeless antique. The poem participates in a reactionary and conservative idiom by identifying itself with an ossified bureaucracy  the International Olympic Committee, they would argue; it actively avoids political engagement by associating itself with an oppressive hierarchy whose promotion of fake spectacles such as the Olympics is sinister in intent. Not only that. The world of the interactive hypertext which technology has brought about combined with late-twentieth century stretching of linguistic parameters has abandoned the printed poem on the page to dinosaur status. Then some would attack the language the poem employs. For them the use of words such as "love" or "glory" is suspect, and they would pour scorn on the very concept of the heroic  some writers see traditional grammar, as used in the poem above, as mindlessly supporting Western power structures and value systems. For them, free verse and its variants is inherently liberating. To impose stanzaic form on an event such as the Olympics is to participate in a repudiation of the modernist ethic, some might say. Where is the improvisatory idiom that a postmodern technique would have embodied? Finally, one might conclude that the occasion for the poem has passed and the poem should thus be consigned to the rubbish bin as soon as possible. Sincere criticisms should always be welcomed. Artists have to expect them, and to learn from them if they can. And good students of poetry, or any of the arts and sciences, should develop critical habits of mind, so that they are not being bamboozled by agendas because agendas of one kind or another are being continuously run in the arts. Sometimes they're run consciously; sometimes there is a general indolence that has been brought about through a failure to challenge prevailing orthodoxies. With this poem students should ask themselves whether such criticisms as I've outlined above have validity  does real heroism exist in an event such as the Olympics?  in the case of the Paralympics I would think the answer pretty obvious; has the poet ever considered the fact that thousands of exploited workers produce the sportswear paraded by overpaid and overhyped athletes? ; isn't the very existence of the torch relay with its bombast just a modern rerun of a Nuremberg war rally? ; and isn't the torch relay an invention of the Nazis at any rate?  so much for the historical links to the ancient games! Well, it is quite proper to ask these kinds of questions and to offer a critique of a poem based on them. You should always look for clarity and directness of expression when someone is writing about the arts, or when you write about the arts. If someone uses arcane language ask yourself why they are using it. See if you can summarise or paraphrase what they are saying, and if you can't ask why not. A work of art is always open to interpretation. It won't tell you how to think or what to feel. But you have to remember that art needs to be read, listened to and looked at carefully if you are going to get to know it well. Well, "triumph of the will" refers to an infamous film made by Leni Riefenstahl for propaganda purposes; it consolidated Hitler's spectacular rise to power. In fact Riefenstahl also made a remarkable film inspired by the Berlin Olympics. Though my poem does not specifically refer to that film, I guess you can't but help think of it in this context. Now I would say that if someone was reading the poem carefully, and realised the import of the reference to the Riefenstahl film, they would have known I was aware of the political agendas that can underlie sporting events. Perhaps someone would then go on to raise the subject of Nietzsche  he wrote a great deal about the "will", or to ask whether the "triumph of the will" can, indeed, lead to "good." Or is the logic of the lines phony. 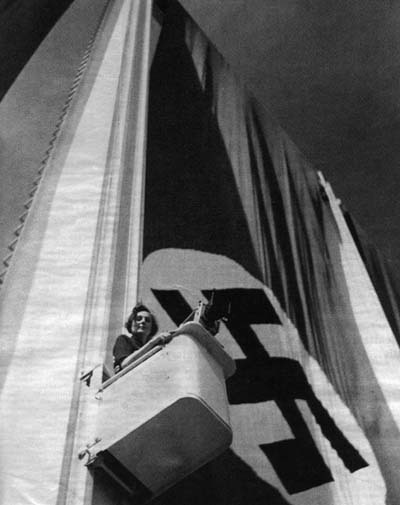 Riefenstahl's film actively contributed to the deplorable predations of National Socialist ideology that ended in wholesale destruction and the annihilation of millions of people. Can we draw a parallel here with the seductive appeal of the contemporary Olympic games in which drug culture operates beneath the surface glamour to subvert a supposedly 'clean' event. But that is just to mention one reference that some might miss on a first reading. The references to the Dreamtime, to Odysseus and to the poets are there for specific reasons too. Why would a poet equate athletic endeavour with poetry writing? There are so many directions in which a discussion could go from this point. But one day you might get around to seeing Riefenstahl's Triumph of the Will, you might participate in a demonstration or get caught up in a crowd event, and then perhaps you would be able to see what I had in mind when I wrote XXVII Olympiad. I had no idea I was going to write that poem until I was woken by that cheer early one morning in 1993. For me it was a purely intuitive piece of writing. I don't know why I wrote it, and don't want to know why I wrote it. Why did that reference to Riefenstahl come unbidden to the surface when I wrote the poem? Once again, I don't know, but I do know that feeling is very important for me in my writing. If my work doesn't convey feeling then I think it has failed. And strong feeling seems to bring metaphoric richness to my work, which I like and want. For some poets this is anathema. They believe you must divest yourself of feeling in your work, and even from meaning, but I reject that. They might argue that XXVll Olympiad avoids 'authenticity' by seeking to impose a formal design on a series of random events. There are so many theories about writing and language, so many definitions of what constitutes a poem, about what makes a valid poem. Of course there can be lots of misunderstandings along the way. For example, my first published poem, 'Australia', finished with the line, "Speech from a glinting continent." What I had in mind was the "glinting" of fossils in uncovered strata  Australia was like an archaeological find whose "speech" was to be discovered after being hidden for too long from the rest of the world. But a lot of people didn't understand that. You just have to hope that a reader might discover for themselves some of the multiple meanings a poem can get into its superstructure. There are artists who mean a great deal to me  Shakespeare, Wagner, Lucian Freud. But you can like a Ren & Stimpy cartoon too. You don't then equate them and say they are the same thing as one another. It's like watching those parodies of classrooms in films where everyone behaves as if they're in a jungle. Students and teachers know a classroom can never be like that, but while we're watching the film we go along with the idea, in a half-hearted kind of way, that freedom means doing whatever we like whenever we want to. You can't, and Shakespeare is, obviously, an infinitely more important phenomenon than Ren & Stimpy. Well, everyone can contribute to the development of culture; you don't have to agree with what comes along, as long as you're actively engaged with the material before you. Useful artists aren't people removed from the reality of peoples' lives. They live in the world and feel the reality of the world just as the mineworker and the nurse, the destitute and lonely, those who are sorrowing and those who are joyful. Eliot's statement that human kind cannot bear very much reality; Gertrude's Stein's idea that most people live in the mindset of the previous century  I find suppositions like these highly offensive; they cannot possibly know such things. It is this kind of thinking that has gradually removed literature, especially poetry, from the mainstream of cultural interest and debate. I might be wrong about everything  some people tell me that I am  but I have to try to write to the best of my ability, even though I know I'm going to fail a lot of the time. Sometimes, when I experience Indian or African culture for instance, I know that my work does not have the naturalness that theirs has, that their world of colour, rhythm and movement, of speech and dance, comes from a spontaneous artistic impulse that can seem artificial and second-hand in my poetry. Still, I take existence in this world as something quite extraordinary, even though it is easy to be cynical and get depressed about human nature. Some art is just that  cynical, depressed. Surely art should have more in it than that. So, to that extent, I take my work seriously, and that means I take my readers seriously too. This is a question you should always ask when you come across any art you haven't encountered before  is it taking me seriously? Or is it just taking itself seriously? I want a poem to take in a part of the world. I want it to be well made, capable of music, depth and relevance  and if it fails on those requirements, then it fails. With reference to XXVII Olympiad, could it be that the millions of people who participated in the games were all taking part in a giant delusion? Were they all living in a political vacuum? Anyone who saw Cathy Freeman light the cauldron or the two Korean Olympic teams come into the stadium together will tell you that they understood perfectly well the politics of the Olympics. Everyone enjoyed themselves, but the event showed the serious side of human endeavour too, and I hope that seriousness is reflected in the poem. It would have been possible to present other responses  a rap song satirising the Olympics, photography putting the Paralympics in context with the so-called able-bodied games; the possibilities are endless. But I can't do those things. I'm a poet and I have to hope that some of the feelings and ideas I had when I wrote the poem come through to a reader. You may like or dislike a poem, but you don't want to read poetry that cannot move you, or encourage you to perceive the world in a different way, and try to do it memorably, whether that happens at a poetry slam or among the library stacks. There is a great deal more that could be said on this topic, but this is probably enough to be going on with. I hope this brief discussion of one poem will lead to some interesting discussions of your own. What follows is a series of quotations that might further help to stimulate your thoughts about poetry and culture. They are taken from the eighteenth and nineteenth century, not because I am antediluvian, but because they are out of copyright. 1 Looking at the noble buildings created by Palladio in this city, and noting how badly they have been defaced already by the filthy habits of men, how most of his projects were far beyond the means of his patrons, how little these precious monuments, designed by a superior mind, are in accord with the life of the average man, one realises that it is just the same with everything else. One gets small thanks from people when one tries to improve their moral values, to give them a higher conception of themselves and a sense of the truly noble. But if one flatters the 'Birds' with lies, tells them fairy tales, caters daily to their weaknesses, then one is their man. That is why there is so much bad taste in our age. I do not say this to disparage my friends; I only say  that is what they are like, and one must not be surprised if things are as they are. 2 There are two kinds of obscurity; one arises from a lack of feelings and thoughts, which have been replaced by words; the other from an abundance of feelings and thoughts, and the inadequacy of words to express them. 3 He was an extremely good musician and an outstandingly accomplished technician, and therefore though you may not be doing art a great service by publishing his complete edition, you are not doing anything shameful. He has become hateful to me not because what he wrote was bad, but because he was a prolific mediocrity incarnate, in the ocean of whose work there is not a single really live passage: everything's fluent, neat, pleasant, but monotonous and barren as a steppe. 4 "Well, then, with that preparation, you wish to try the life of the artist; you wish to try a life of arduous, unceasing work, and  uncertain praise. Your praise would have to be earned, like your bread; and both would come slowly, scantily  what do I say?  they might hardly come at all." "I thought that you, being an artist, would consider the life one of the most honourable and delightful. And if I can do nothing better?  I suppose I can put up with the same risks as other people do." "Do nothing better?" said Klesmer, a little fired. "No, my dear Miss Harleth, you could do nothing better  neither man nor woman could do anything better  if you could do what was best or good of its kind. I am not decrying the life of the true artist. I am exalting it. I say, it is out of reach of any but choice organisations  natures framed to love perfection and to labour for it; ready, like all true lovers, to endure, to wait, to say, I am not yet worthy, but she  Art, my mistress  is worthy, and I will live to merit her. An honourable life? Yes. But the honour comes from the inward vocation and the hard-won achievement: there is no honour in donning the life as a livery." 5 "Some lust and boredom: that so far has been their best reflection. All their harp jingling is to me the breathing and flitting of ghosts; what have they ever known of the fervour of tones? "Nor are they clean enough for me: they all muddy their waters to make themselves appear deep. And they like to pose as reconcilers: but mediators and mixers they remain for me, and half-and-half and unclean. "Alas, I cast my net into their seas and wanted to catch some good fish; but I always pulled up a head of some old god... Certainly, pearls are found in them: they are that much more similar to hard shellfish. And instead of a soul I often found salted slime in them.
" From the sea they learned even its vanity: is not the sea peacock of peacocks?...Verily, their spirit itself is the peacock of peacocks and a sea of vanity! The spirit of the poet craves spectators  even if only buffaloes. "But I have grown weary of this spirit; and I forsee that it will grow weary of itself. I have already seen the poets changed, with their glances turned back on themselves. I saw ascetics of the spirit approach; they grew out of the poets." 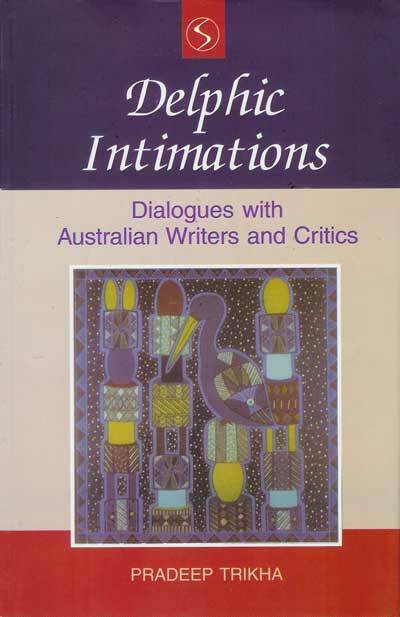 The following interview with Indian academic Pradeep Trikha took place in October 2003 and is excerpted from Delphic Intimations, published during the 2007 Kolkata Book Fair at a function facilitated by the Australia International Culture Council, Asialink and the Department of Foreign Affairs & Trade in collaboration with the Australia India Council and the National Library of Kolkata. How do writers in Australia view nationalism? Is there a discourse about national identity? There is an extremely interesting debate going on between Australian historians at the moment about the reasons for the decline in the Aboriginal population in Tasmania during the nineteenth century. There is a lot of disagreement about the causes for it and about how our history can be honestly written to give a truthful account of the past. Well, I would say that nationalism is another of those topics on which there would be a lot of disagreement. The interesting thing about Australia is that it’s a country where there can be a wide variety of opinions canvassed. Personally, I don’t have much time for nationalism. Excessive nationalism seems to lead to political disaster. What is important to me is the freedom that I have because of the sacrifice of othersmy parents’ generation. Their sacrifice gave me my freedom. Without that understanding I don’t see how you can properly approach the question of your personal political and artistic freedom. So, one is proud to be an Australian on that account, but otherwise I write as a citizen of the world. I must be open to the world, and my work must reflect the world, a part of which is going to be Australian. Perhaps the cynical and humorous parts of the Australian character get into my work more obviously than other parts. I don’t know. Would you like to say something about recent Australian poetry? Well, there’s a lot of it, and I can’t say I know a lot of it all that well. You have to be careful with creative time, which of course includes reading time. There is one writer I’ve been reading extensively recently, and I’ve enjoyed her work so much. That’s Gwen Harwood. Her Collected Poems came out this year. It is so good to get into the work of a writer where you don’t have to discount all the strange claims people will make about a poet. I mean, here is the real thing, a poet writing from the genuine poetic source. She is memorable, isn’t interested in fashion, and is sincere. Oscar Wilde warned about the illusory quality of sincerity in poetry, but I think it’s important to be sincere in the sense that you believe you have something to say, and you want to make what you have to say memorable. A lot of the poetry I read today doesn’t seem to me to have anything to say. It hankers after an avant-garde reputation. But how often does a really revolutionary writer come along who transforms language? Once or twice a century I would say. The trouble is that when you strip away all the strident theorising and rodomontade you are often left with a product whose shelf life is minimal. But with Gwen Harwood I find the core real, the feeling real. She should be much better known. But the cult of personality places temporary auras over less-deserving writers. That’s the way of the world. Which poets have been important to you? Look, I hate to mention obvious names, but Shakespeare has to come out on top. I take his greatness as a given. But it is worrying that you do come across some people these days who make claims to being interested in literature who will question his status. You are dealing there with outright philistinism, and there’s a lot of it about. Emily Dickinson is someone for whom I have profound respect and admiration. How was such a phenomenon possible? If you are interested in modernism in poetry, I think she is protomodern. Her work will always be preternaturally fresh and invigorating. You still feel the ice and the heat coming off the page. She is a nonpareil in poetry, in my opinion. And there’s Whitman, who is a great writer too. I don’t think any American poet has gone further than those two. I was keen on Stevens once, but these days I find his icehouse aesthetics dispiriting. Auden means a lot to me. I like his insouciance, and the depth of feeling breaking through the brittle surface at odd times. Sometimes he shows off his knowledge of the Oxford English Dictionary too much, but I guess it’s better to know too much language than too little, if you’re a poet! How could I possibly do justice to all the poets I enjoy reading and who mean so much to me. Keats. Those odes are perfection‘Already with thee! tender is the night.’ The Australian poets who mean the most to me are those who led by example, who did the very hard yards in the history of Australian literature. I don’t necessarily like their work all that much, but I respect their dedication and, in some cases, their suffering. Francis Webb is always the poet who is going to be mentioned here. Such nobility in the face of personal difficulty. He spent a good deal of time in psychiatric hospitals in the grip of schizophrenia. Why is free verse a popular form in current Australian poetry writing? Has free verse something to do with the topography of the continent? Free verseis there such a thingis popular with some poets, but not others. I am no expert on this topic. A poet must develop their own style of expression, and if free verse helps them do that, fine. There is no great value in any particular style of writing except in that it helps you to achieve expressive memorability. Whether free verse has anything to do with topographyI would say no. Look at the poems written about Australia. There are many different approaches to this subject. Here’s my poem ‘Australia’. You tell medoes this poem reflect Australian topography? It’s not something I consciously think about. This Dreaming and the snake’s strange stare. Thought bruised against each monolith. Speech from a glinting continent. Judith Wright once said in the Foreword to Because I Was Invited“Our times have not been kind to poetry.” Do you concur with her view? But why on earth should time be kind to poetry? The times have not been kind to millions of people on this planet who have been destroyed in unimaginably horrible and painful ways. I cannot stand the idea that art is somehow special in the sense that it is removed from the real world. No. Art must be part of the world’s pain and beauty. And only then is it going to have a chance of lasting and of being useful to people. Poetry’s present poor reputation with the general public is a problem for poets, not for the general public who have learned to find their poetry in other places. And who can really blame them. Don’t misunderstand me. I think art is supremely important. But art has to be a living thing, and it becomes a living thing when the artist’s imagination is engaged with the realities of existence. I think Wagner one of the most fully engaged artists from this point of view. He takes the world, and the suffering in the world, seriously. There is a kind of litterateur about these days who needs to be thought politically correct and who implies that he or she is untouched by the impurities, the difficulties, the massive contradictoriness of life. But I like artists who have that divided self and who reflect that in their work. To me, that is the way you get art that the public will eventually get around to reading or listening to or looking at. I have absolutely no interest in being read by a coterie who will give me a tick for fitting into some prevailing ideology. That means nothing to me. But if someone says to meyour work moved me, it made me think about things in a new waythat means something special. And if someone saysyour work is awfulfine. You can’t please everyone, and it’s a mistake to try to. To what extent is your work autobiographical in nature? I would have thought one hundred per cent. How can you write something that isn’t coming from out of your blood, sweat and tears. That doesn’t mean that you don’t recreate imaginatively. You invent and play with languagethat’s what a poet is supposed to do, surely. However, the sensibility is yours. Well, you sometimes read work that is dressed in the emperor’s clothes, but I hope my work isn’t like that. The anxiety of influence idea doesn’t reach far enough for me. What about the joy of influence. How disastrous not to be influenced by the grandeur of Shakespeare and Goethe and Dickinson. I want to take in all the creative beauty that I can. You only ever do something worthwhile when you have humility before the greatness of the past. And that means being open to the art and science and politics about you, reacting to it, against it, the work from the past, and the work being done now. Your poems have a rhythmic sensibility of their own. Has this come about through your interest in music? I have always had the strongest feeling for music. I started listening to music before I started writing, and I knew Wagner’s music dramas, Mahler’s symphonies, Bruckner’s symphonies, and a great deal besides, before I was twenty. When I say I knew them, naturally I mean I listened to them. You don’t really get to know works like that for a long, long time. At the same time I listened to musicals and took part in Gilbert and Sullivan shows. I heard the popular music of my time. But whether that musical experience has anything to do with the rhythmic sensibility of my poetryI don’t think so. Music makes you feel, and your feelings are variable, unpredictable. I like my lines to have tension and energy, but I don’t think, for example, that you versify Bruckner and get your metrical energy from him. No, such a thing isn’t possible. I was in Vienna last year and saw a tremendous performance of Britten’s Billy Budd which I couldn’t get out of my head for months. The Vienna Philharmonic in full cry is something else, believe me. The dramatic impact of that performance certainly got me round to writing something later on that year, but it is a far more mysterious process than simply listening to music and then writing. But you know, I like Nine Inch Nails too. I enjoy lots of types of music. If you are a true music lover I think you get to enjoy more and more music as you get older. However, I don’t like analysing why I do things. If my writing isn’t spontaneous, I distrust it. Whether this fits in with any particular theory of art, I don’t know. I distrust all theories of art. How does travelling leave an impression on your writing? Well, I just mentioned my time in Vienna. Later on, on that same trip, I went to Berlin. Now, you can’t come to Berlin without being made acutely aware of the way in which history can be derailed for evil purposes. I was deeply affected by my time in Berlinthe Jewish Museum, the Kollwitz memorial in the Unter den Linden. And while I was there, there was a massacre of teachers and students in Erfurt. All of these experiences have been feeding my writing subsequently. Your antennae must be open to what is going on about you. But as Dickinson shows, you don’t have to go travelling to be open to the world. The aim should be to be the still point of the turning world, at least while you write. As I said earlier, I think of myself as a citizen of the world, and I want my work to hold some of the world’s variety and strangeness. The danger is pretentiousness, but you can avoid that if you have history sitting on your shoulder. Australia is a multicultural society. What implications does that have, and what suggestions would you like to make to the younger generation of authors and poets? I don’t think I’m a good person to give advice because I never took advice from others. And that led to a certain intransigence on my part which I think you need to produce worthwhile art. I would say that you must read as much as possible, listen to as much as possible and look at as much as possible. Then, be critical of your own work. Be extremely critical of your own work. Be honest with yourself about what you are doing. I hear a lot of people being negative about other work, but not being particularly honest about their own writing. Poetry is suffering from the equivalent of bulimia at the moment. There is simply too much of it around. And there is no virtue in being told that your work is brilliant by your friends, which is all some reviewing amounts to. You mentioned multiculturalism. In itself, there is nothing especially noteworthy in being a ‘multicultural writer’. What does that mean? You write well or you don’t. Your origin, your society they influence youbut you are one person, and your internal divisions make up the whole of what you write. But you are not an interesting writer because of your multicultural background. A great deal of contemporary culture is worthless in my opinion because it is simply product churned out to make money. And some so-called multicultural writing is just like that. Art requires a certain aloneness, an apartness from the kind of ersatz popularity contests we see put forth these days as ‘artistic’. In your apartness you discover real worth. But you can’t teach these things. They have to be learnt the hard way. It is always difficult for a writer because you can’t really go somewhere and learn to write in the same way you go to art school or to a conservatorium to learn counterpoint. What are your impressions of India? The pavilions of your demise. Swathed in veils with bloody patterning. Where death’s a friend whose treachery’s expected. Is equitable cultural exchange possible through literature between two nations? Perhaps, sometimes, but often not. The annoying thing for Australians, as I have already outlined with Gwen Harwood and Francis Webb, is that we have artists who have produced work every bit as good as anything that is being done elsewhere, but which hasn’t received the attention it deserves. Once you understand the way the system works to reinforce the status quo, you take matters into your own hands and proceed along the path less travelled. The way culture gets accommodated and talked about in the media is susceptible to corrupt practice I’m afraid, so independence from all of that is vital. The important thing is to read and think critically in a spirit that doesn’t leave you open to propagandising. Remember, another energy lets loose you know when you really believe in what you are doing, not arrogantlybecause arrogance never achieved anything in artbut with the knowledge of what has led to your moment. To do something truthfully and freelythat is the thing. There is nothing more fulfilling for the artist than that.